Home > Staff > Laura Brandt, Ph.D.
Ph.D. Department of Wildlife Ecology and Conservation. 1997. University of Florida, Gainesville, Florida. Dissertation title: Spatial and temporal changes in tree islands of the Arthur R. Marshall Loxahatchee National Wildlife Refuge. M.S. Biology. 1989. Florida International University, Miami, Florida. Thesis title: The status and ecology of the American alligator (Alligator mississippiensis) in Par Pond, Savannah River Site. B.S. Biology. 1983. The Pennsylvania State University, University Park, Pennsylvania. Minor in Marine Sciences. Crocodilian monitoring and assessment, Climate Envelope Modeling, Amphibians and round-tailed muskrats as indicators, Improving linkages and integration between management issues and science needs for Landscape Conservation (SHC). Brandt, Laura A, Mark R. Campbell, and Frank J. Mazzotti. 2010. Spatial Distribution of Alligator Holes in the Central Everglades. Southeastern Naturalist. In Press. Lynch, R.L., H. Chen, L.A. Brandt, and F.J. Mazzotti. 2009. Hurricane caused treefalls and their role in the invasion of the Old World climbing fern (Lygodium microphyllum). Natural Areas Journal. 29(3):500-505. Mazzotti, F.J., G.R. Best, L.A. Brandt, M.S. Cherkiss, B.M. Jeffery, K.G. Rice. 2009. 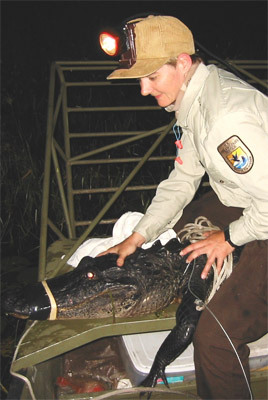 Alligators and crocodiles as indicators for restoration of Everglades ecosystems. Ecological Indicators. 9(6) Supplement 1 Indicators for Everglades Restoration. Pp. S137-S149. Mazzotti. F.J., L.A. Brandt, P. Moler, and M.S. Cherkiss. 2007. The American Crocodile (Crocodylus acutus) in Florida: Recommendations for Endangered Species Recovery and Ecosystem Restoration. Journal of Herpetology 41(1):122-132. Ugarte, C.A., L.A. Brandt, S. Melvin, and F.J. Mazzotti. 2006. Hurricane Impacts of tree islands in Arthur R. Marshall Loxahatchee National Wildlife Refuge. Southeastern Naturalist. 5(4):737-746. Brandt, L.A., Martin, G.A., and Mazzotti, F.J. 2006. Topography of pop-up bayhead tree islands in Arthur R. Marshall Loxahatchee National Wildlife Refuge. Florida Scientist. 69(1):19-35. Babbitt, K.J., M.J. Baber, and L.A. Brandt. 2006. The effect of woodland proximity and wetland characteristics on larval anuran assemblages in an agricultural landscape. Can. J. Zool. 84:510-519. Zweig, C.L., F.J. Mazzotti, K.G. Rice, L.A. Brandt and C.L. Abercrombie. 2004. Evaluation of field measurements of the American alligator for use in morphometric studies Herpetological Review. 35(1):43-44. Brandt, L.A., D. Ecker, I. Gomez Rivera, A. Traut, and F.J. Mazzotti. 2003. Wildlife and vegetation of bayhead islands in the A.R.M. Loxahatchee National Wildlife Refuge. Southeastern Naturalist. 2(2):179-194. Pearlstine, L.G., S.E. Smith, L.A. Brandt, C.R. Allen, W.M. Kitchens, and J. Stenberg. 2002. Assessing state-wide biodiversity in the Florida Gap analysis project. Environmental Management 66(2):127-144 (doi:10.1006/jerna.2002.0551). Brandt, L.A. and D. Black. 2001. Impacts of the introduced fern, Lygodium microphyllum, on tree islands of the Arthur R. Marshall Loxahatchee National Wildlife Refuge. Florida Scientist. 64(3):191-196. Brandt, L.A. and F.J. Mazzotti. 2000. Nesting of alligators at the Arthur R. Marshall Loxahatchee National Wildlife Refuge. Florida Field Naturalist. 28(3):122-126. Brandt, L.A., K.M. Portier, and W.M. Kitchens. 2000. Patterns of change in tree islands in Arthur R. Marshall Loxahatchee National Wildlife Refuge from 1950 to 1991. Wetlands. 20(1):1-14. Pearlstine, L.G., L.A. Brandt, F.J. Mazzotti, W.M. Kitchens. 1997. Fragmentation of pine flatwood communities converted for ranching and citrus. Landscape and Urban Planning. 38(1997):159-169. Brandt, L.A., F.J. Mazzotti, J.R. Wilcox, P.D. Barker Jr., G.L. Hasty, J. Wasilewski. 1995. Status of Crocodylus acutus at a power plant site in Florida. Herpetological Natural History 3(1):29-36. Pearlstine, L.G., L.A. Brandt, W.M. Kitchens, F.J. Mazzotti. 1995. Impacts of citrus development on habitat of southwest Florida. Conservation Biology 9(5):1020-1032. Depkin, F.C., L.A. Brandt, and F.J. Mazzotti. 1994. 1994. Nest sites of Florida Sandhill Cranes in southwest Florida. Florida Field Naturalist 22(2):39-47. Brandt, L.A., K.L. Montgomery, A.W. Saunders, F.J. Mazzotti. 1993. Gopher tortoise burrows. Life history note. Herpetological Review. 24(4):149. Brandt, L.A. 1991. Long-term changes in a population of Alligator mississippiensis in South Carolina. Journal of Herpetology 25(4) p 419-424. Brandt, L.A. 1991. Growth of juvenile alligators in Par Pond, Savannah River Site, South Carolina. Copeia 1991(4):1123-1129. Brandt, L.A. and F.J. Mazzotti. 1990. The behavior of juvenile Alligator mississippiensis and Caiman crocodilus exposed to low temperature. Copeia 1990(3) p 867-871. Mazzotti, F.J. and L.A. Brandt. 1988. A new method for live trapping wary crocodiles. Herpetological Review. 19(2):40 41. Rice, K. G., F. J. Mazzotti, and L.A. Brandt. 2005. Status of the American alligator (Alligator mississippiensis) in southern Florida and its role in measuring restoration success in the Everglades. Pp. 145-153 In: Status and Conservation of Florida Amphibians and Reptiles. W. E. Meshaka and K. J. Babbitt (eds.) Krieger Publishers, Melbourne, Florida. Ogden, J.C., S.M. Davis, and L.A. Brandt. 2003. Science strategy for a regional ecosystem monitoring and assessment program: the Florida Everglades example. Pp. 135-163 In: Monitoring Ecosystems: Interdisciplinary Approaches for evaluating ecoregional initiatives. D.Busch and J. Trexler (eds.). Island Press. Brandt, L.A., J. E. Silveira, W. M. Kitchens. 2002. Tree Islands of the Arthur R. Marshall Loxahatchee National Wildlife Refuge. Pp.311-336 In: Tree Islands of the Everglades. F.H. Sklar and A. van der Valk (eds). Kluwer Academic Publishers, The Netherlands. Heisler, L., D.T. Towle, L.A. Brandt, and R.T. Pace. 2003. Tree island vegetation and water management in the central Everglades. Pp. 283-310 In: Tree Islands of the Everglades. F.H. Sklar and A. van der Valk (eds). Kluwer Academic Publishers, The Netherlands. Mazzotti, F.J. and L.A. Brandt. 1994. Ecology of the American alligator in a seasonally fluctuating environment. Pp. 485-506 In: Everglades: The Ecosystem and Its Restoration. S.M. Davis and J.C. Ogden (eds). St. Lucie Press. Delray Beach, Florida.